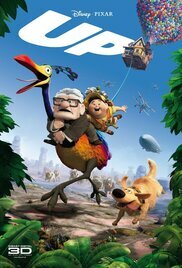 Plot: A young Carl Fredrickson meets a young adventure spirited girl named Ellie. They both dream of going to a Lost Land in South America. 70 years later, Ellie has died. Carl remembers the promise he made to her. Then, when he inadvertently hits a construction worker, he is forced to go to a retirement home. But before they can take him, he and his house fly away. However, he has a stowaway aboard: an 8-year-old boy named Russell, who's trying to get an Assisting the Elderly badge. Together, they embark on an adventure, where they encounter talking dogs, an evil villain and a rare bird named Kevin.